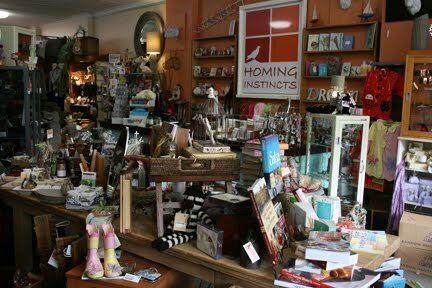 I think I may have mentioned previously, one of my very best friends (Jennie) has a wonderful home decorating store called “Homing Instincts”. Well, today I have had the best day as it was my first day of working Tuesdays in her store. I was a little bit nervous at first but once I got in the swing of the day I had an amazing time. She has the most amazing eclectic assortment of products, it’s like I have spent my day in Aladdin’s Cave. Without fail all the customers that come into the store comment how great everything is. I am so looking forward to spending next Tuesday there again. “Living to Learn”: My whole day today was a fantastic new learning experience. “Davine Time”: Even though I was working – just allowing myself to love and enjoy my day. The store looks wonderful. All kinds of happy things to look at and be around. Looks like Tuesdays will be your lucky day as well. The only info I could find on that doll is it was made by a company called "Sweet Heart" and the name of the doll is "Little Big Horn." I haven't had a chance to google this yet but if you find anything please let me know. Thanks.